Facebook Promotes Election "War Room" To Thwart Fake News, Spam, Hate Speech, Voter Suppression [VIDEO] - Joe.My.God. Facebook is promoting a new “war room” as a part of its solution to election interference, unveiling a team of specialists working to stop the spread of misinformation and propaganda. It’s unclear how well it’s working. The Silicon Valley company, which has faced intensifying scrutiny over its role in amplifying malicious political content, opened its doors to reporters to tour a new workspace at its Menlo Park headquarters on Wednesday. 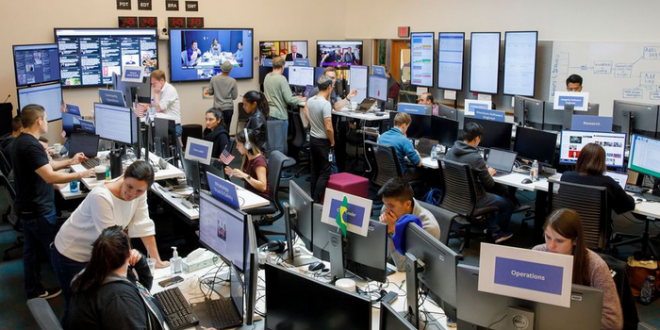 Engineers, data scientists, threat investigators and other Facebook experts from 20 teams recently began collaborating inside the so-called “war room”, a term that political campaigns typically use to describe operation centers. Employees gazed at constantly updating charts on several large video screens to monitor things like potential “voter suppression” campaigns or spam operations intended to mislead U.S. users. The room felt a bit cramped because the staff members were working in such close proximity to each other. An American flag was placed on one wall, while a Brazilian flag was on another, indicating the team’s work monitoring the polarized elections in the South American country. Facebook executives said that there will likely be staff working in the room all day in the lead up to the U.S. elections. Employees look for suspicious spikes in spam and hate speech, in some cases using custom software built for the purpose. They look for efforts at voter suppression, such as falsely telling people that lines are long or that the election has been delayed. Other employees use CrowdTangle, a company acquired by Facebook that monitors the viral spread of articles across platforms, to detect which articles are trending on Facebook, Instagram, Twitter, and Reddit.